If I did not know better, I would say that the temple is an alien spaceship ready to fly off into the space at any time. Have you heard of religions sharing shrines? Never? Well, it happened once in Cambodia. 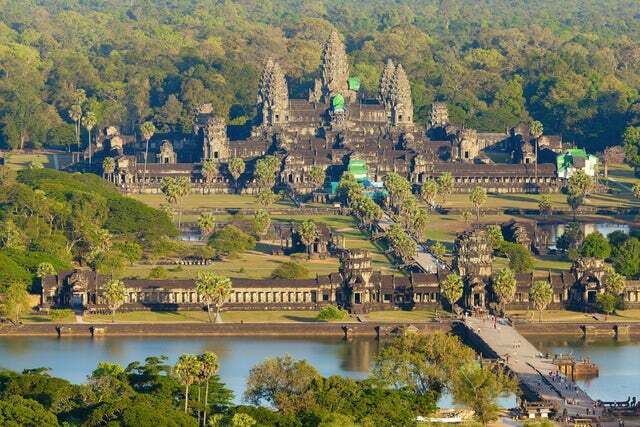 Angkor Wat was first a Hindu religion temple and then later it was turned into a Buddhist temple. It is located in Cambodia and was first built by Khmer King Suryavarman II in the early 12th century in Yasodharapura, the capital of the Khmer Empire. It is the world's largest religious monument and one of the most visited religious sites in the world. Below are a few interesting facts that you need to know about Angkor Wat. 1. 50% of international tourists visit Cambodia to see this religious monument. As if to show how proud they are of their heritage, the monument is featured on their national flag. Afghanistan's current flag is the only other national flag to feature a national monument. 2. Angkor Wat is the best representation of classical style of Khmer architecture. 3. The temple has been built to represent Mount Meru, the home of the Hindu Mythology lord of Brahma and the demi-god devtas. 4. Unlike other temples in the region that are aligned facing to the east, this temple was aligned to the west. It faces sunset and the evening sun adds to its beauty in the evening. 5. It is not until the 16th century that the temple came to be known by its present name. Prior to this, it was known as Pisnulok, the official title of the Khmer king Suryavarman II that built it. 6. In recognition of the important part it played in both the Hinduism and Buddhism, UNESCO declared it a World Heritage Site in 1992. 7. Although most tourists know of the Angkor Wat temple complex, the city comprises of Angkor Thom and the Bayon Temple which are equally intriguing. 8. Unlike his predecessors who belonged to lineage of kings who practiced ‘Shaivism’ and thus their supreme God was Lord Shiva; Suryavarman II broke ranks with them and built this temple that is dedicated to Lord Vishnu. 9. The decorations on the walls of the temple have a uniquely Hindu story telling characteristics. They have fables and myths pictures that tell of the temple's origin in Hindu religion. 10. The site receives more than 2 million visitors annually for a reason - It ebbs an aura of divinity that can only be found in Incan and Mayan holy shrines. Angkor Wat is a sight to behold. It forms a nice picture backdrop that one treasures forever. Its beauty belongs more to the postcards than reality...and yet, the temple is as real as they come. If I did not know better, I would say that the temple is an alien spaceship ready to fly off into the space at any time.